When writing academic papers, students need to cite information from other sources to support their arguments. Citations give strength to a piece of writing, while showing readers that the writer has extensively read expert research material in the relevant subject area(s). Accurate and appropriate citations help writers build trust and persuade readers with strong arguments formed from extensive reading. They also help writers avoid plagiarism while referring to expert ideas in an accepted manner. There are generally three types of source citations, including direct quotation, paraphrase and summary. English is now the most widely ‘taught, learnt and spoken language in the world’ (Kachru, 2006, p 9). English has become the most commonly used language on the planet (Kachru, 2006, p 9). A summary is a much shorter version of only the key point(s) of an original article. It is about 10% the size of the original source. Whenever you use another writer’s words or ideas, you must accurately credit these sources with in-text citations. There are many different styles of doing this, so make sure (before you write your paper) to check with your lecturer which style is most appropriate to your course. This is important as different courses use different styles. Also, be sure that once you have selected the appropriate referencing style for your course, that you follow it consistently throughout your paper(s). Some of the most common formats for citing sources include APA, MLA, Oxford, Chicago and Harvard, each with its own specific set of rules. 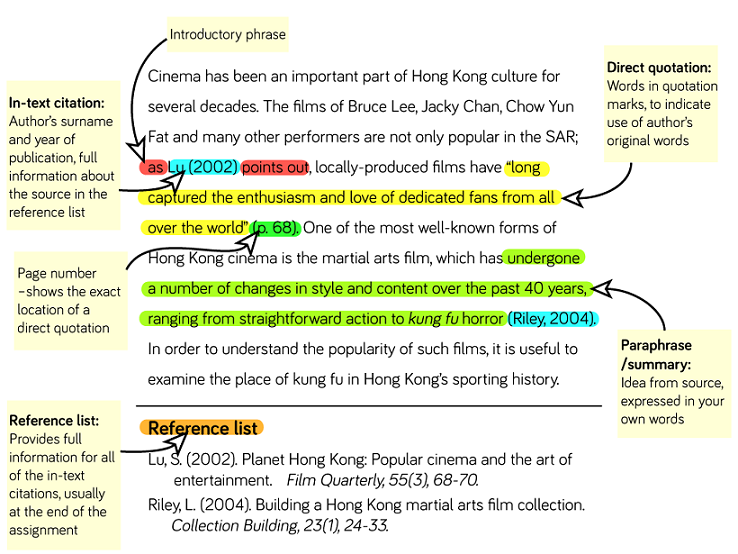 The interactive tasks in the lesson below will provide practice in APA referencing style only, though much of the content may be applicable to other formatting conventions. At first, in-text referencing of sources can seem challenging, but with a little practice, you can learn how to do it correctly and soon it will become easy. Here are some errors that students often make when referencing sources in their writing. Study them carefully then complete the exercises that follow. There is no in-text referencing / sources used to support the facts / numbers presented. All of the author's names are used. Only given names of the author were used in the text. The author's initials were included in the text. The month or day (or both) was included. The page number is missing. The year of publication is missing. 'Someone' or 'some researchers' is instead of the exact name of the author/authors and date. The verb does not 'agree with' the subject/author. (Correct 1: Smith (2008) reports that 72% of men in Vancouver do not smoke (p. 2). (Correct 2: Smith and Jones (2008) report that 72% of men in Vancouver do not smoke... (p. 2). Some authors are missing in the in-text reference. Both 'according to' and a reporting verb (+ that)' are used. (Correct 1: According to Smith (2008), 72% of men in Vancouver... …(p. 2). (Correct 2: As mentioned by Smith (2008), 72% of men in Vancouver... …(p. 2). Carefully read the instructions before completing each task below.